eisVogel v2 ENB Do not install exteriors and weather options! ELFX Exteriors Open Cities Patch If using the "Exteriors" option of ELFX. 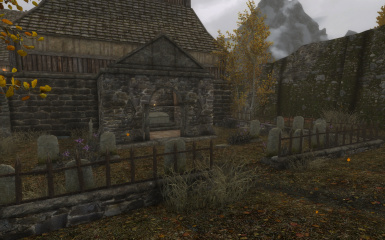 ELFX Weathers - TrueStorms Merged Compatibility SSE **Just the "ELFX - Weathers" esp that's available along with the main ELFX file. Enhanced Lights and FX Patches Always needed. Why would you need a Patch without it? 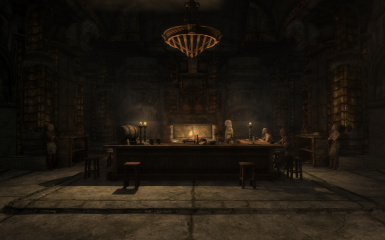 Perseid's Inns and Taverns - Realistic Room Rental Enhanced If you use the patches available. 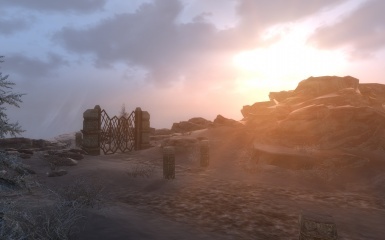 Vegan Reshade for Organic ENB Don't check any options on first page of installation, check SMIM meshes if using SMIM. 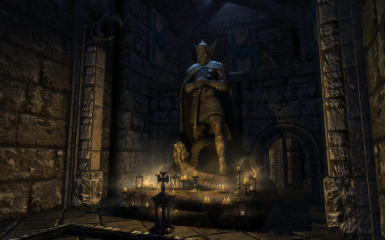 -Fix for Kynareth Temple window I didn't notice before. 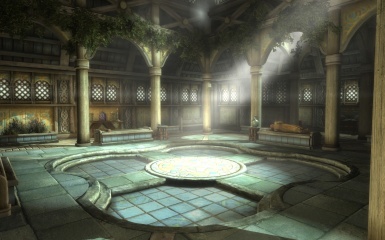 -Fix for Temple of Kynareth. -Small performance fixes for some cells. -Tweaked some meshes for compatibility with Better Dynamic Snow, let me know how it goes. 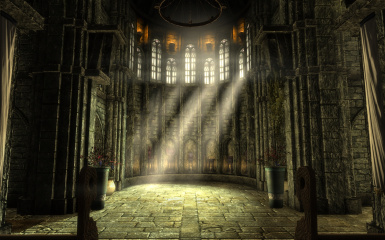 ELFX Weathers - God Rays reenabled, I forgot those. Matched the Oldrim version of the mod. Main Module - Changed the external emmitance for firepit light in inns and jarl longhouses so it doesn't go dim during the day. ELFX Exterior - Updated the building meshes for the windows to be lit in the night and still use the multilayer shader. ELFX Weathers - Tweaks for the nights, made stars visible in aurora clear nights and removed the moon in cloudy nights. - New flame for torches. 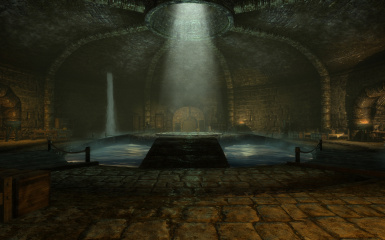 - Uploaded the Windhelm wall fix I forgot. 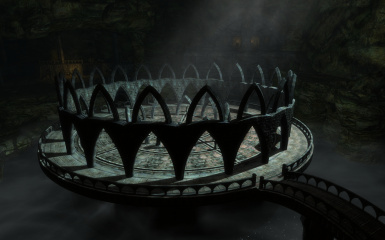 - Fixes for catacombs meshes and Windhelm market buildings roofs. 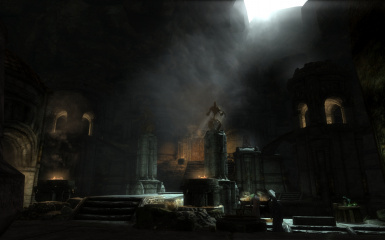 Enhanced Lights and FX has the goal to create a more dramatic and realistic mood to the Skyrim lights by adding lights to all light sources and removing any light without a source, as well as the addition many more effects like smoke, volumic lights, driples, etc. I made some friendly redesigns as needed too, and some redesigns for more dramatic looking. 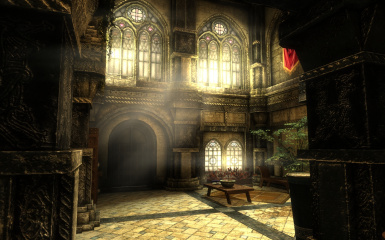 -All light sources emits light, even the windows in interiors. -New translucent effect to market stands and imperial tents. 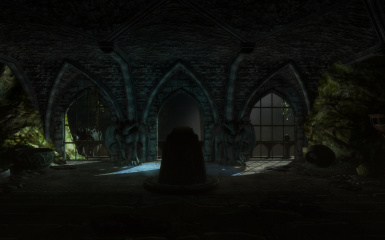 -More shadow lights in specific places. -Each Inn with its own set of lights based in it's local weather. -Each city with its own set of colors based in it's local weather. 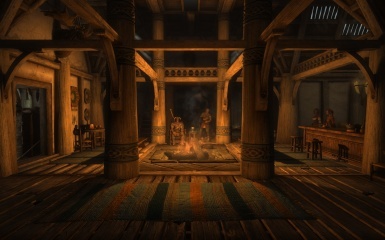 -Enhanced the difference between night and day in interiors. -Darkened fog colors and tweakened it's distances. -Reduces color tints so no "white" lights. 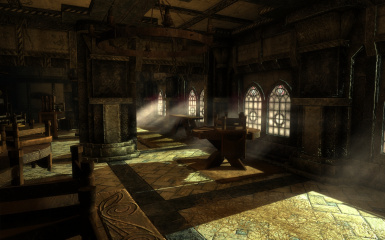 -Dynamic lighting templates that changes the ambient lighting depending of the lighting in the place. -Slight increased contrast and saturation. -Makes all places not inhabited by humans really dark. 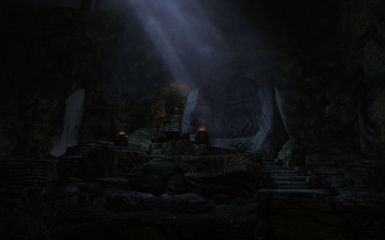 -Changes exterior light placements and fx. -New shaders for the exterior windows on the big cities buildings. 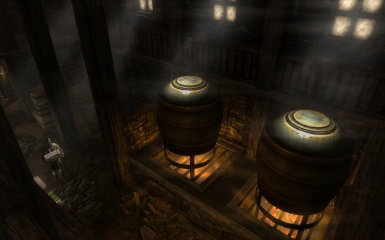 -New lantern bugs for Riften area. -Fake Shadows added to bridges, ships and boats over the waters. -Removes the "Doesn't light landscape" flag from many lights so those lights the ground generated by heightmap. -Adds the "Never fades" flag to almost all lights in exteriors so those can be seem from greater distances depending on your INI settings. -A few friendly new light placements. -Bigger sun with new textures creating intense sunrises and sunsets. -More dense rains with new texture and heavier rain sound for storms. 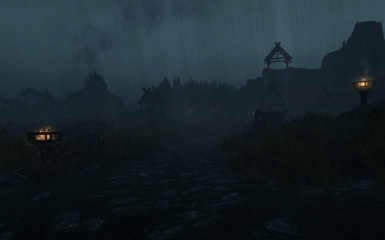 -The fog from fog weathers more strong allowing you to see only a few meters ahead. -Nights are darker and depends on the weather. Clear nights will be brighter than stormy ones. 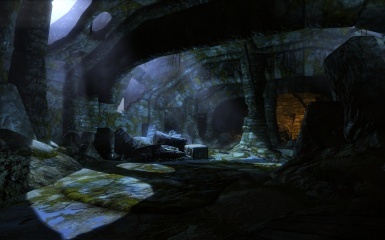 -Changes the ice shaders for ice floes and frozen lakes. 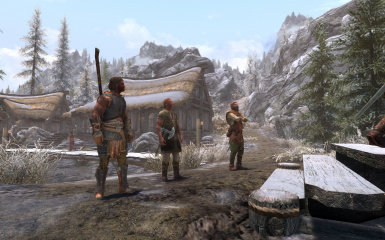 Download the mod using Nexus Mod Manager, activate it and pick the modules you want in the installer. Should be compatible with any mod that doesn't change light, fx or the meshes it adds, my meshes are a must have, so make sure it overwrites anything it asks to. You can stick with LOOT load order. 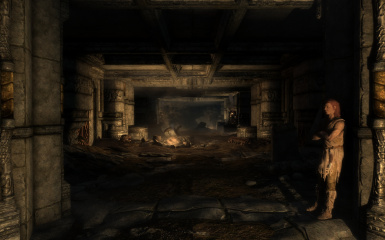 -Should be compatible with any mod that doesn't change imagespaces and lighting templates, which means ambient light, fog, contrast, saturation, bloom, depth of field, etc. -It should be compatible with everything that doens't place an object over the light sources I placed. You can stick with LOOT load order. -It should be compatible with any mod that doesn't change the weathers. 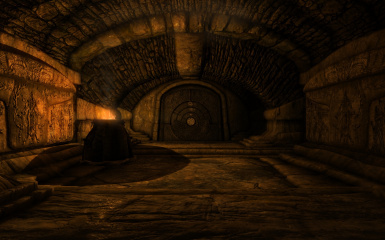 It may be compatible with Climates of Tamriel, because it doesn't change the vanilla weathers, but I don't recommend it, because CoT has so much weathers that you may barely experience mine. -It should be compatible with any ice retexture and any mod that change the icebergs. 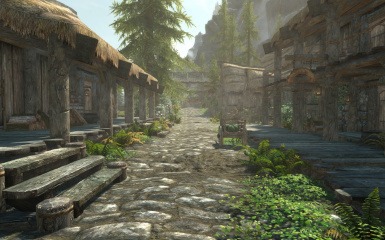 It should be compatible with any ENB setting, but I won't give any support to features that are changed by the ENB. -zaga86 for his ice textures.